Make your growing kid comfortable and happy by choosing the right style of diaper. With Pant Style, your kid can easily walk and run around, without facing any kind of hesitation while wearing diaper. Absorbancy of 6 glasses provides undisturbed sleep to your child! Do you know that the right diaper will ensure complete hygiene and care for the baby? You should always be careful while choosing the right diaper for your little one. The prime note that should be kept in mind while selecting any diaper for your baby is comfort. Mamy Poko, a reputed brand brings you unique comfortable pant style diapers that will keep your baby happy and bubbly all day long. Your baby will always be happy and playful if he/she is given the right care and concern. With the pant style diapers, your kid can easily make movements. He can easily walk, run and move around without feeling any discomfort and hesitation. The diaper is made with a super absorbent technology that can absorb for about six glasses of fluid. These are long lasting diapers and can stay up to eight to ten hours. It is advisable to change the diapers as frequently as possible to keep the baby’s skin dry and fresh, and away from wetness. The extra large Mamy Poko Pants come with better fits. These baby diapers are actually designed to provide a complete cushiony feel that can keep the baby’s skin soft and supple throughout day and night. The large size of the nappy pad and the stretchable feel help the baby to avoid friction and rashes against the skin. The vulnerable areas between their legs and around their thighs are prone to infection and skin irritation. This is why it is necessary to change their damp nappy pads even if they are slightly wet or soaked, and you can also dispose these diapers after use. So, get these Mamy Poko pants for your little one who can therefore enjoy absolute comfort 24x7. With Softer Elastic for a more comfortable fit, it is gentle on the baby's skin and its breathable material keeps the baby fresh and comfortable. Quickly absorbs upto 6 glasses and gives your baby long lasting dryness. With Fit Covers that fit comfortably and prevent leakage. 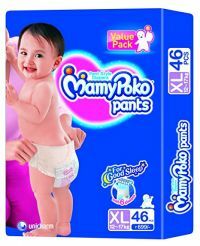 To Recieve updates and possible rewards for Mamy Poko Pant Style Diaper XS / New Born please sign in. To Recieve updates and possible rewards for Diapers & Nappies please sign in.